Professor David Ullman is among the world's leading authorities on demonic literature. Not that he's a believer. He sees what he teaches as a branch of the imagination and nothing more. So when offered a luxury trip to Venice to consult on a 'phenomenon', he accepts, taking his 11-year-old daughter Tess with him. Amidst the decadent splendour of the city, David makes his way to the address he's been asked to visit. What he witnesses in the tiny attic room shakes him to the core: a man restrained in a chair, clearly insane. But what David hears the man say is worse. The voice of his father, dead for 30 years, repeating the last words he ever spoke to his son. Words that have left scars - and a mystery - behind. Terrified, David is determined to leave with Tess as quickly as possible. But he can't shake the feeling that something is following him. And then, before his eyes on the roof of their hotel, Tess disappears. But before she falls into the Grand Canal's waters, she utters a plea: Find me. 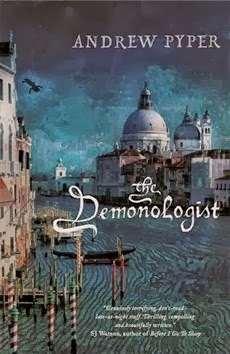 The Demonologist is a book that jumped out at me, but I ummed and ahhed over reading it as I am not heavily into scary books, so after much deliberation I caved and bought it. Unfortunately (or perhaps that should be fortunately) it was not the 'I can't sleep with the lights off' fear inducing read that I was expecting. In saying that though it did have a high creepiness level. I think the biggest downfall to this novel for me was that I did not feel emotionally invested with the characters. I really didn't find myself caring enough about them which made it very easy to distance myself from the story and the 'horrors' that they faced. The plot was intriguing and mysterious but as much as I wanted to find out what was going to happen it certainly wasn't a book that I could not put down, therefore it took me a lot longer to finish it than I had expected. The Demonologist is a creepy tale of mystery and demons that endeavors to make you change the way you see the world and the battle between good and evil. But it is certainly not a spine-chilling read.